A family that plays together, stays together. At least that’s the way it is for this group of four. 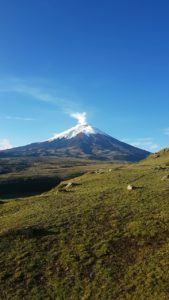 David and his three kids are in Ecuador setting their sights on Cotopaxi during this family expedition. Summit of Rucu Pinchincha with Tikka the dog! They began like we always do at Alpenglow, with a climb of Rucu Pinchincha rising high above Quito. Lead guide Jaime Avila reported that they all moved super fast, ascending to the 15,696′ summit in 2:10. 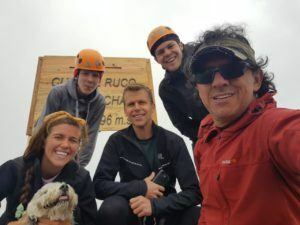 Even the dogs in Ecuador are pretty darn acclimatized, Jaime’s dog Tikka joined in on the climb and made it into the summit selfie. The next day the team traveled to Tambopaxi inside Cotopaxi National Park where they were greeted with the most incredible view of Cotopaxi itself. This lodging location is one of our favorite places in the world, a world class lodge with hot showers, craft beer, WiFi, a fantastic kitchen and most of all a clear view of the mountain and route you will be climbing. Once inside the national park they moved up the mountain for a little acclimatization and reached 16,400′. 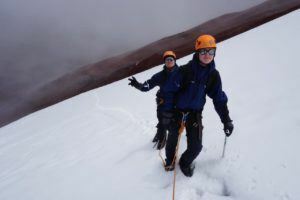 Acclimatization is a critical component to any high altitude expedition and Cotopaxi makes it easy. We drive to about 15,000′ and hike straight from the car. The next morning the team awoke to a classic and incredible view from Tambopaxi. The plan for the day included climbing high on the mountain to begin glacier school. Once on the mountain they put on crampons and donned their ice axes, working on self arrest drills and learning the fundamentals of climbing in a rope team. In the afternoon they descended back to Tampopaxi for a lazy few hours of rest, eating, and preparing for the summit push. The summit push begins tonight as they wake up, put on their boots, and begin climbing at around midnight local time.